What is the difference between a neural network and a deep neural network, and why do the deep ones work better? I haven't seen the question stated precisely in these terms, and this is why I make a new question. What I am interested in knowing is not the definition of a neural network, but understanding the actual difference with a deep neural network. For more context: I know what a neural network is and how backpropagation works. I know that a DNN must have multiple hidden layers. However, 10 years ago in class I learned that having several layers or one layer (not counting the input and output layers) was equivalent in terms of the functions a neural network is able to represent (see Cybenko's Universal approximation theorem), and that having more layers made it more complex to analyse without gain in performance. Obviously, that is not the case anymore. Let's start with a triviliaty: Deep neural network is simply a feedforward network with many hidden layers. This is more or less all there is to say about the definition. Neural networks can be recurrent or feedforward; feedforward ones do not have any loops in their graph and can be organized in layers. If there are "many" layers, then we say that the network is deep. How many layers does a network have to have in order to qualify as deep? There is no definite answer to this (it's a bit like asking how many grains make a heap), but usually having two or more hidden layers counts as deep. In contrast, a network with only a single hidden layer is conventionally called "shallow". I suspect that there will be some inflation going on here, and in ten years people might think that anything with less than, say, ten layers is shallow and suitable only for kindergarten exercises. Informally, "deep" suggests that the network is tough to handle. But the real question you are asking is, of course, Why would having many layers be beneficial? I think that the somewhat astonishing answer is that nobody really knows. There are some common explanations that I will briefly review below, but none of them has been convincingly demonstrated to be true, and one cannot even be sure that having many layers is really beneficial. I say that this is astonishing, because deep learning is massively popular, is breaking all the records (from image recognition, to playing Go, to automatic translation, etc.) every year, is getting used by the industry, etc. etc. And we are still not quite sure why it works so well. I base my discussion on the Deep Learning book by Goodfellow, Bengio, and Courville which went out in 2017 and is widely considered to be the book on deep learning. (It's freely available online.) The relevant section is 6.4.1 Universal Approximation Properties and Depth. You must be referring to the so called Universal approximation theorem, proved by Cybenko in 1989 and generalized by various people in the 1990s. It basically says that a shallow neural network (with 1 hidden layer) can approximate any function, i.e. can in principle learn anything. This is true for various nonlinear activation functions, including rectified linear units that most neural networks are using today (the textbook references Leshno et al. 1993 for this result). If so, then why is everybody using deep nets? Maybe a shallow network would need more neurons then the deep one? Maybe a shallow network is more difficult to train with our current algorithms (e.g. it has more nasty local minima, or the convergence rate is slower, or whatever)? Maybe a shallow architecture does not fit to the kind of problems we are usually trying to solve (e.g. object recognition is a quintessential "deep", hierarchical process)? I think the current "consensus" is that it's a combination of bullet points #1 and #3: for real-world tasks deep architecture are often beneficial and shallow architecture would be inefficient and require a lot more neurons for the same performance. But the paper linked above shows that a "wide" residual network with "only" 16 layers can outperform "deep" ones with 150+ layers. If this is true, then the whole point of the above figure breaks down. 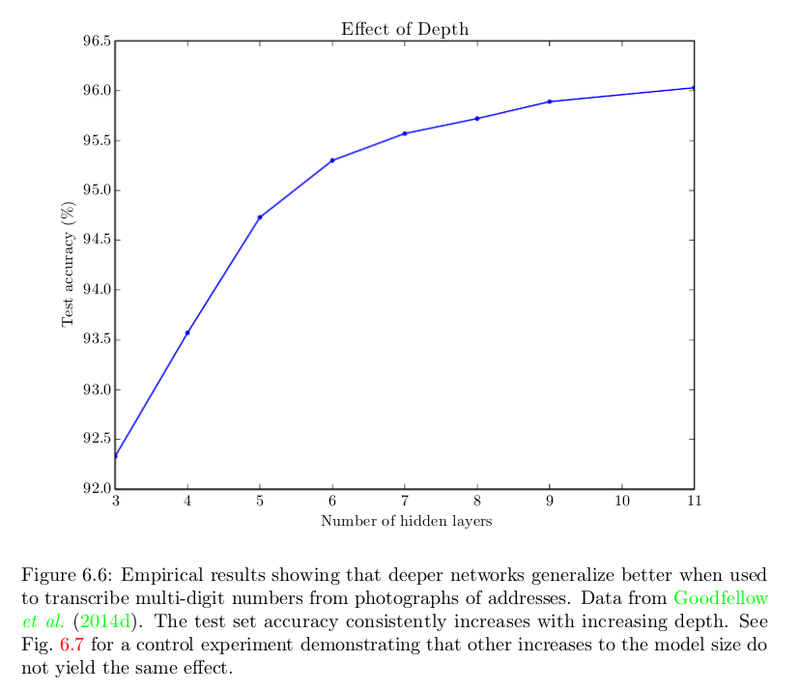 In this paper we provide empirical evidence that shallow nets are capable of learning the same function as deep nets, and in some cases with the same number of parameters as the deep nets. We do this by first training a state-of-the-art deep model, and then training a shallow model to mimic the deep model. The mimic model is trained using the model compression scheme described in the next section. Remarkably, with model compression we are able to train shallow nets to be as accurate as some deep models, even though we are not able to train these shallow nets to be as accurate as the deep nets when the shallow nets are trained directly on the original labeled training data. If a shallow net with the same number of parameters as a deep net can learn to mimic a deep net with high fidelity, then it is clear that the function learned by that deep net does not really have to be deep. If true, this would mean that the correct explanation is rather my bullet #2, and not #1 or #3. As I said --- nobody really knows for sure yet. The amount of progress achieved in the deep learning over the last ~10 years is truly amazing, but most of this progress was achieved by trial and error, and we still lack very basic understanding about what exactly makes deep nets to work so well. Even the list of things that people consider to be crucial for setting up an effective deep network seems to change every couple of years. The deep learning renaissance started in 2006 when Geoffrey Hinton (who had been working on neural networks for 20+ years without much interest from anybody) published a couple of breakthrough papers offering an effective way to train deep networks (Science paper, Neural computation paper). The trick was to use unsupervised pre-training before starting the gradient descent. These papers revolutionized the field, and for a couple of years people thought that unsupervised pre-training was the key. Then in 2010 Martens showed that deep neural networks can be trained with second-order methods (so called Hessian-free methods) and can outperform networks trained with pre-training: Deep learning via Hessian-free optimization. Then in 2013 Sutskever et al. showed that stochastic gradient descent with some very clever tricks can outperform Hessian-free methods: On the importance of initialization and momentum in deep learning. Also, around 2010 people realized that using rectified linear units instead of sigmoid units makes a huge difference for gradient descent. Dropout appeared in 2014. Residual networks appeared in 2015. People keep coming up with more and more effective ways to train deep networks and what seemed like a key insight 10 years ago is often considered a nuisance today. All of that is largely driven by trial and error and there is little understanding of what makes some things work so well and some other things not. Training deep networks is like a big bag of tricks. Successful tricks are usually rationalized post factum. We don't even know why deep networks reach a performance plateau; just 10 years people used to blame local minima, but the current thinking is that this is not the point (when the perfomance plateaus, the gradients tend to stay large). This is such a basic question about deep networks, and we don't even know this. Update: This is more or less the subject of Ali Rahimi's NIPS 2017 talk on machine learning as alchemy: https://www.youtube.com/watch?v=Qi1Yry33TQE. I'll just answer in the form of a story, should make things more fun and clear. No tldr here. In the process you should be able to understand what the difference is. There are multiple reasons why DNNs sparked when they did (stars had to align, like all things similar, it's just the matter of right place, right time etc). One reason is the availability of data, lots of data (labeled data). If you want to be able to generalize and learn something like 'generic priors' or 'universal priors' (aka the basic building blocks that can be re-used between tasks / applications) then you need lots of data. And wild data, might I add, not sterile data-sets carefully recorded in the lab with controlled lighting and all. Mechanical Turk made that (labeling) possible. Second, the possibility to train larger networks faster using GPUs made experimentation faster. ReLU units made things computationally faster as well and provided their regularization since you needed to use more units in one layer to be able to compress the same information since layers now were more sparse, so it also went nice with dropout. Also, they helped with an important problem that happens when you stack multiple layers. More about that later. Various multiple tricks that improved performance. Like using mini-batches (which is in fact detrimental for final error) or convolutions (which actually don't capture as much variance as local receptive fields) but are computationally faster. In the meantime people were debating if they liked em more skinny or more chubby, smaller or taller, with or without freckles, etc. Optimization was like does it fizz or does it bang so research was moving towards more complex methods of training like conjugate gradient and newtons method, finally they all realized there's no free lunch. Networks were burping. What slowed things down was the vanishing gradient problem. People went like: whoa, that's far out, man! In a nutshell it means that it was hard to adjust the error on layers closer to the inputs. As you add more layers on the cake, gets too wobbly. You couldn't back-propagate meaningful error back to the first layers. The more layers, the worse it got. Bummer. Some people figured out that using the cross-entropy as a loss function (well, again, classification and image recognition) provides some sort of regularization and helps against the network getting saturated and in turn the gradient wasn't able to hide that well. What also made things possible was the per-layer pre-training using unsupervised methods. Basically, you take a bunch of auto-encoders and learn increasingly less abstract representations as you increase the compression ratio. The weights from these networks were used to initialize the supervised version. This solved the vanishing gradient problem in another way: you're already starting supervised training from a much better start position. So all the other networks got up and started to revolt. But the networks needed supervision anyway, otherwise it was impossible to keep the big data still. Now, for the last part that finally sort of leads to your answer which is too complex to put in a nutshell: why more layers and not just one. Because we can! and because context and invariant feature descriptors. and pools. Here's an example: you have a data set of images, how are you going to train a plan NN using that data? Well, naively, you take let's say each row and you concatenate it into one long vector and that's your input. What do you learn? Well, some fuzzy nonsense functions that might not look like anything, because of the many many types of variances that the objects in the image contain and you are not able to distinguish between relevant and irrelevant things. And at some point the network needs to forget to be able to re-learn new stuff. So there's the capacity issue. This is more non-linear dynamics, but the intuition is that you need to increase the number of neurons to be able to include more information in your network. So the point is that if you just input the image as one piece, adding extra layers does not do too much for you since you're not able to learn abstractions, which is very important. Doing things holistically thus does not work that well, unless you're doing simpler things with the network like focusing on a specific type of object, so you limit yourself to one class and you pick on some global properties as a classification goal. So what's there to do? Look at the edge of your screen and try to read this text. Problem? As stupid as it sounds, you need to look at what you're reading. Otherwise it's too fuzzy / there's not enough resolution / granularity. Let's call the focus area the receptive field. Networks need to be able to focus too. Basically instead of using the whole image as input, you move a sliding window along the image and then you use that as input to the network (a bit less stochastic than what humans do). Now you also have a chance to capture correlations between pixels and hence objects and you also can distinguish between sleepy cat sitting on a sofa and an upside-down cat bungee jumping. Neat, faith in humanity restored. The network can learn local abstractions in an image on multiple levels. The network learns filters, initially simple ones and then builds up on those to learn more complex filters. And remember: big learning, deep data. Word. In layman terms, the main difference with the classic Neural Networks is that they have much more hidden layers. You can find a good explanation at this question in Quora. And, if you are interested in this subject I would reccoment to take a look at this book. I've also been confused a bit in the beginning by the difference between neural networks (NN) and deep neural networks (DNN), however the 'depth' refers only to the number of parameters & layers, unfortunately. You can take it as some sort of re-branding under the so-called 'Canadian Mafia'. Several years ago, I also had Neural Networks as a part of a class and we did digit recognition, wave approximation and similar applications by using NN, which had multiple hidden layers and outputs and all that jazz that DNN's have. However, what we didn't have then was computing power. The reason that made the move to DNN possible and desirable are the advances in hardware development. Simply put, now we can compute more, faster and more parallelized (DNN on GPU's), while before, time was the bottleneck for NN's. As referenced on the Wikipedia's page for Deep Learning, the 'deep' part refers mostly to having features interact in a non-linear fashion on multiple layers, therefore performing feature extraction and transformation. This was also done in standard NN's, however at a smaller scale. As far as I know, what is called Deep Neural Network (DNN) today has nothing fundamentally or philosophically different from the old standard Neural Network (NN). Although, in theory, one can approximate an arbitrary NN using a shallow NN with only one hidden layer, however, this does not mean that the two networks will perform similarly when trained using the same algorithm and training data. In fact there is a growing interest in training shallow networks that perform similarly to deep networks. The way this is done, however, is by training a deep network first, and then training the shallow network to imitate the final output (i.e. the output of the penultimate layer) of the deep network. See, what makes deep architectures favorable is that today's training techniques (back propagation) happen to work better when the neurons are laid out in a hierarchical structure. A-1) Until very recently, at least in Computer Vision, we couldn't train models on millions of labeled images; simply because labeled datasets of that size did not exist. It turns out that, beside the number of images, the granularity of the label set is also a very crucial factor in the success of DNNs (see Figure 8 in this paper, by Azizpour et al.). A-2) A lot of engineering effort has gone into making it possible to train DNNs that work well in practice, most notably, the advent of GPU implementations. One of the first successful GPU implementations of DNNs, runs on two parallel GPUs; yet, it takes about a week to train a DNN on 1.2 million images of 1000 categories using high-end GPUs (see this paper, by Krizhevsky et al.). B-1) The use of simple Rectified Linear Units (ReLU) instead of sigmoid and tanh functions is probably the biggest building block in making training of DNNs possible. Note that both sigmoid and tanh functions have almost zero gradient almost everywhere, depending on how fast they transit from the low activation level to high; in the extreme case, when the transition is sudden, we get a step function that has slope zero everywhere except at one point where the transition happens. B-2) The story of how neural network architectures developed over the years reminds me of how evolution changes an organism's structure in nature. Parameter sharing (e.g. in convolutional layers), dropout regularization, initialization, learning rate schedule, spatial pooling, sub-sampling in the deeper layers, and many other tricks that are now considered standard in training DNNs were developed, evolved, end tailored over the years to make the training of the deep networks possible the way it is today. The difference between a "Deep" NN and a standard NN is purely qualitative: there is no definition of what that "Deep" means. "Deep" can mean anything from the extremely sophisticated architectures that are used by Google, Facebook and co which have 50-80 or even more layers, to 2 hidden layers (4 layers total) architectures. 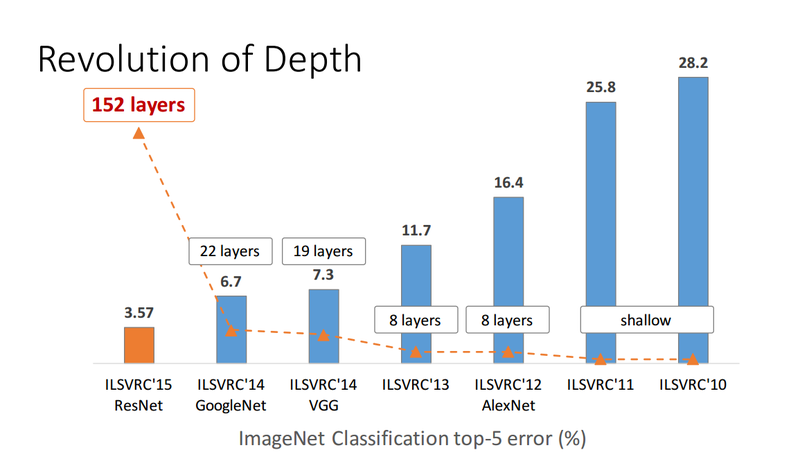 I wouldn't be surprised if you could even find articles claiming to do deep learning with a single hidden layer, because "deep" doesn't mean much. "Neural network" is also a word that doesn't have a very precise meaning. It covers an extremely large ensemble of models, from random boltzman machines (which are undirected graphs) to feedforward architectures with various activation functions. Most NNs will be trained using backprop, but it doesn't have to be the case so even the training algorithms aren't very homogenous. Overall, deep learning, deep NNs and NNs have all become catch-all words which capture a multitude of approaches. For good introductory references into "what changed": Deep Learning of Representations: Looking Forward, Bengio, 2013 is a good review + perspective for the future. Also see Do Deep Nets Really Need to be Deep? Ba & Caruana, 2013 which illustrate that being deep might not be useful for representation but for learning. To expand on David Gasquez's answer, one of the main differences between deep neural networks and traditional neural networks is that we don't just use backpropagation for deep neural nets. Why? Because backpropagation trains later layers more efficiently than it trains earlier layers--as you go earlier and earlier in the network, the errors get smaller and more diffuse. So a ten-layer network will basically be seven layers of random weights followed by three layers of fitted weights, and do just as well as a three layer network. See here for more. So the conceptual breakthrough is treating the separate problems (the labeled layers) as separate problems--if we first try to solve the problem of building a generically good first layer, and then try to solve the problem of building a generically good second layer, eventually we'll have a deep feature space that we can feed in to our actual problem. The move to DNN is due to three independant breakthroughs which happened in 2006.
universal approximation theorem or Cybenko theorem: a feed-forward neural network with a single hidden layer can approximate any continuous function. However in practice it may require much more neurons if a single hidden layer is used. I wouldn't say there is any big philosophical difference between NN and DNN (in fact I would say DNN is just a marketing term to distinguish from 'failed' NN) . What has changed is the size of the data sets. Essentially neural networks are currently the best $O(n)$ statistical estimators, working well for high dimensional large datasets (e.g. imagenet). I think you should step back and see that this has created a resurgence in shallow AI -- e.g. bag of words for sentiment analysis and other language applications and visual bag of words was leading approach to image recognition before DNN. No one is saying bag of words is a true model of language, but it is an effective engineering solution. So I would say DNN are a better 'visual bag of words' -- see e.g. Szegedy et al. 2013 Intriguing properties of neural networks and Nguyen et al. Deep Neural Networks are Easily Fooled: High Confidence Predictions for Unrecognizable Images where it is clear that there is no higher order structures etc. being learned (or whatever is claimed for DNN). Deep Learning is a set of algorithms in machine learning that attempt to model high-level abstractions in data by using architectures composed of multiple non-linear transformations. What are the effects of depth and width in deep neural networks? Why does “stack more layers” work? Deep networks vs shallow networks: why do we need depth? When would a 3-layer Neural Network perform better than a 2-layer with the same number of parameters? What is the accepted definition of a Shallow Convolutional Neural Network? Why are neural networks becoming deeper, but not wider? How true is this slide on deep learning claiming that all improvements from 1980s are only due to much more data and much faster computers? To design a Multilayer Perceptron, should I use more units per layer and less layers or more layers and less units, which is better? Is there any difference between training a stacked autoencoder and a 2-layers neural network? Transition from “old-school” neural network methods to deep learning? What *is* an Artificial Neural Network? What can Deep Neural Networks do that Support Vector Machines can't?